With a potentially fierce Ohio Winter in the not-so-distant future, it's hard to think about crocuses and hyacinths. But Spring-flowering hardy bulbs like daffodils and tulips must be planted in the Fall in order to bloom in Spring because they require a long period of cool temperatures to spark the chemical process that causes them to flower. It's important to get them into the ground about six weeks before the ground freezes. During the time leading up to the freeze, the bulbs will have a change to develop deep, strong roots. When choosing a location in which to plant your bulbs, remember that the Sun and shade patterns in late September/early October are different than those in the Spring. Also, the leaves on non-evergreen trees will not have leafed out next Spring, so your bulbs will receive more sun through the bare branches than an area may be receiving now. 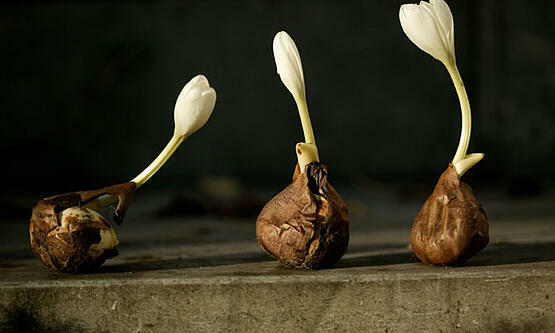 Hardy bulbs should be planted as follows, nose up. If you've noticed critters stealing your bulbs in the past, you can cover the bulb with fine mesh cloth from the hardware store before replacing the dirt. Ohio Utilities Protection Service - Call Before You Dig. This is a free service offered in Ohio. Now, if you're dropping some crocus bulbs 2 inches under the surface, chances are you won't run into any problems. But when you get down to the 6-8" depths, it's always better to be sure. Not only is it safer, but it's also the law. You don't always know where utility lines are buried in your yard - maybe the previous owner ran a cable out back so he could watch football in the shed - and it could be terribly catastrophic should you strike an electric cable with a metal shovel. Call them at this number, and they will come out to mark all your utilities within 48 hours - 1-800-362-2764, or visit them at the link above to fill out an online request form. Have any other questions about Autumn lawn and landscape practices? Interested in setting up a program this Fall to ensure your lawn reaches its maximum potential in the Spring? Contact one of knowledgeable, friendly customer service representatives whose local numbers are listed here or click below to get started. We'll answer all your questions without pressuring you to sign on any dotted line!